changes, giving clear and sharp legibility. • Continuous indication of liquid level. • Local and remote display. • No leakage to atmosphere. • Particularly suitable for dangerous or toxic fluids. • Ideal for liquid interface applications. 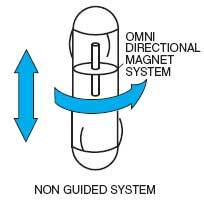 • Powerful omni-direction magnet system – guide-free float. • Display can be rotated through 360° irrespective of float position. • PTFE/PFA lined, PP, PVDF and uPVC versions. • Simple to engineer and easy to install. • An economical alternative to: Conventional level gauges and other level measuring systems. • Display unit protection IP67. 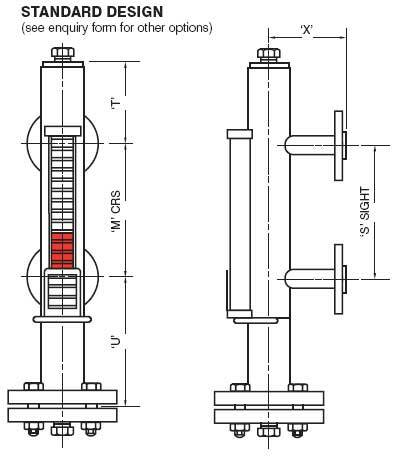 Magnetic Level Gauges, depend not only on the integrity of the chamber but also on the float design and the ability to satisfy all design parameters, ie. specific gravity, pressure and temperature, without compromising the magnetic linkage to the display and associated controls. Many competitive systems sacrifice display performance by using smaller and weaker magnet systems to achieve low SG and higher pressures, invariably with detrimental effect. Others use guided and vented floats to achieve the same result, which again can prove limiting and troublesome. The system, built on many years experience, has taken all these factors into consideration and designed out these problem areas. This unique system uses a patented ferrite moulded wafer system, which combined with a sealed guide-free float carrying a powerful omni-directional magnet system, provides ultimate performance and reliability, even under the most severe conditions. level of the liquid in the chamber. The wafers resist accidental disturbance (e.g. vibration) due to their edge magnetisation and mutual attraction. To complement the range, the Magnetic Gauge can be supplied with Alarm Switches or Transmitter and Controller to remotely display the liquid level.